The Center for Immigration Studies reports All Employment Growth Since 2000 Went to Immigrants. Actually, greater than 100% of jobs went to immigrants because the number of non-immigrants holding a job is negative, and the total must equal 100%. On a population adjusted basis, the numbers look horrific. 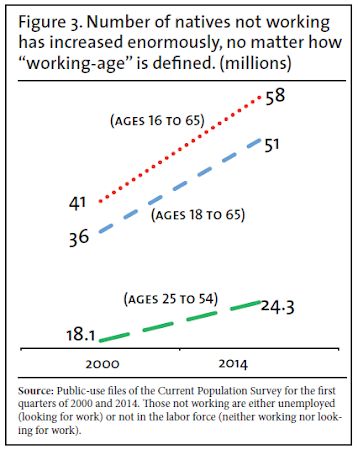 Population-wise, native US citizens account for two-thirds of the working-age population growth, yet fewer work today. Here's the harsh reality: 17 million working-age native US citizens were not working in the first quarter of 2014 than in 2000. Let's dive into the interesting 29 page report by Steven A. Camarota and Karen Zeigler. Here are some items of interest from the report. With 58 million working-age natives not working, the Schumer-Rubio bill (S.744) and similar House measures that would substantially increase the number of foreign workers allowed in the country seem out of touch with the realities of the U.S. labor market. 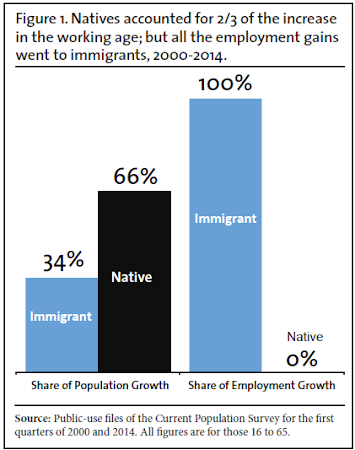 The trends since 2000 challenge the argument that immigration on balance increases job opportunities for natives. Over 17 million immigrants arrived in the country in the last 14 years, yet native employment has deteriorated significantly. The total number of working-age (16 to 65) immigrants (legal and illegal) holding a job increased 5.7 million from the first quarter of 2000 to the first quarter of 2014, while declining 127,000 for natives. In the first quarter of 2000, there were 114.8 million working-age natives holding a job; in the first quarter of 2014 it was 114.7 million. Immigrants have made gains across the labor market, including lower-skilled jobs such as maintenance, construction, and food service; middle-skilled jobs like office support and health care support; and higher-skilled jobs, including management, computers, and health care practitioners. Immigration has fallen in recent years. But despite the economy, between 2008 and the start of 2014 6.5 million new immigrants (legal and illegal) settled in the country and three million got jobs. Over the same time, the number of working-age natives holding a job declined 3.4 million. If the employment rate of working-age natives in the first quarter of this year were what it was in 2007, 7.9 million more natives would have a job. If the share working were what it was in the first quarter of 2000, 12.5 million more natives would have a job today. Some may think that immigrants and natives never compete for jobs. But a majority of workers in virtually every occupation are native-born. Immigrants have made gains across the labor market in lower-, middle-, and higher-skilled jobs. 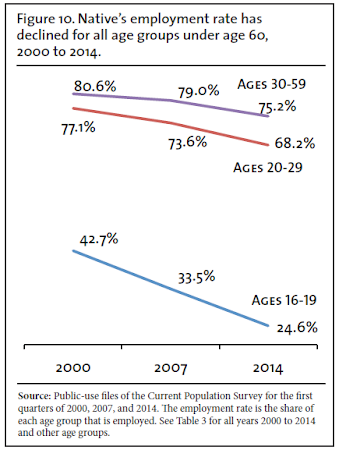 Thus the idea that there are jobs Americans don’t do is simply not supported by the data. While the extent to which immigrants displace natives from the labor market is debated in the academic literature, there are several things we can say based on the last 14 years. More than one million new immigrants arrived in the country every year since 2000. The long-term decline in employment among natives is certainly supportive of the research showing that immigration reduces employment among the native-born. In contrast, the last 14 years challenge the argument that immigration on balance significantly increases job opportunities for natives. There is no question that immigration has not stimulated the economy enough to create job growth among working-age natives and prevent a dramatic decline in employment rates and labor force participation. There is certainly no question that high levels of immigration go hand in hand with a profound deterioration in native-born employment. 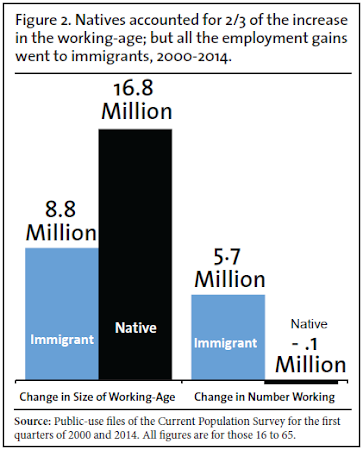 Even if one ignores the last 14 years and believes that immigration stimulates the economy to create a net increase in jobs for natives, then the same should be true when natives are added to the workforce by moving from not working to working. Some may respond that natives do not want to work. But the U-6 employment rate indicates that millions not working do, in fact, want to work. There is also anecdotal evidence that many natives simply have given up looking for work because the job market is so bad. When this happens, they cease to show up in the U-3 or even the U-6 unemployment rate. Moreover, many natives currently not working were doing so as recently as 2007. Given the abysmal employment and labor force participation rates, particularly of the native-born, it is difficult to take at face value assertions by employer groups that workers are in short supply or to justify the dramatic increase in immigration levels in the Schumer-Rubio bill (S.744). It's a fascinating study that many will brand as inflammatory. Yet, the data speaks for itself. Some will blame the immigrants. However, policies are to blame, not the immigrants.